Brin was born on our farm on June 1, 2018. She was part of a set of twins. Both her and her sister, Billie Jean, look just like their mom, Eretria! Brin has beautiful blue eyes, and has also got a lot of her mom’s personality. She loves attention, and will come over and rub on your leg (or boot) to get some love – which is exactly what Eretria does, although Eretria also likes to stand on your foot at the same time. Brin’s sire is Prince. Brin got her unique name from the same book series that her mom, Eretria, was named from: the Shannara series, by Terry Brooks (Jeff’s favourite author). 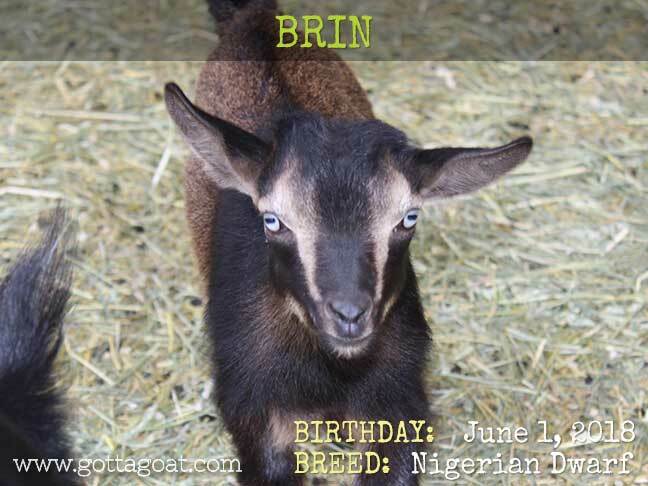 Brin is polled (naturally hornless), and is an unregistered Nigerian Dwarf doe.